Home > Health Career Entry > Is Health the Right Career Choice for Me? With health care comprising one of the largest and perhaps most important sectors of government spending and jobs, it is little wonder that many people are asking if a health career is the right choice for them. Before you embark on a health career, however, there are many considerations that you should take into account, all of which can help you to make the best decision for your career. Whether you end up choosing a career in nursing or a more traditional medical career, the decision is a life-changing one that warrants careful consideration. At the most basic level, the vast majority of health careers involve interaction with other people. While there are exceptions such as medical laboratory scientists who work in clinical settings with other hospital or research personnel, most health careers will involve work either directly with patients or other health professionals. 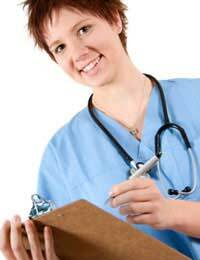 Careers such as nursing, for example, are at the forefront of patient interaction. If you prefer work that is more remote and less interactive, a health career may not be the best fit. On the other hand, individuals who have strong interpersonal skills and are effective communicators have a good starting point for considering a health career. Perhaps the most important aspect of embarking on a health career is your passion for medicine and health care itself. If you care about improving the health of others and extending the human lifespan, you are more likely to gain job satisfaction when taking on a health career. People who work in health care typically enjoy the knowledge that their career work is benefiting the health of people in their country and perhaps around the world. Health careers are generally in demand throughout the UK, which means that you will be employable in virtually any UK city or town. Health careers such as nursing are also transferable in the sense that you can often apply your education, training and experience to work in other countries around the world. Job hours do vary tremendously though, so you should keep in mind the demands of different health careers. Physicians, for instance, take on an extremely heavy workload during university years while the career itself can often involve very long shifts that include overnights and on-call. If you're a night owl, then you might relish the opportunity to work nights and make an excellent salary but if you prefer Monday to Friday, standard daytime work, then other health careers such as administrative or management positions might be more appealing. Overall, health careers can usually satisfy a variety of preferences around working hours and the working environment, so it's likely that there is a health career that will be of interest. While you know best what career will be the ideal fit for your personality, interests and life goals, your friends and family can often provide helpful input and advice about your qualities. Have a chat with those who know you well because they might offer some interesting insight and suggestions about health careers they see being a successful fit for you. Your health career is far more than merely a paycheque. By considering a health career, you will join the many medically-oriented people who keep us all healthy through their specialised training and care. If you are someone who wants to make a difference in the lives of those around you, then a health career might just be the best choice for you.